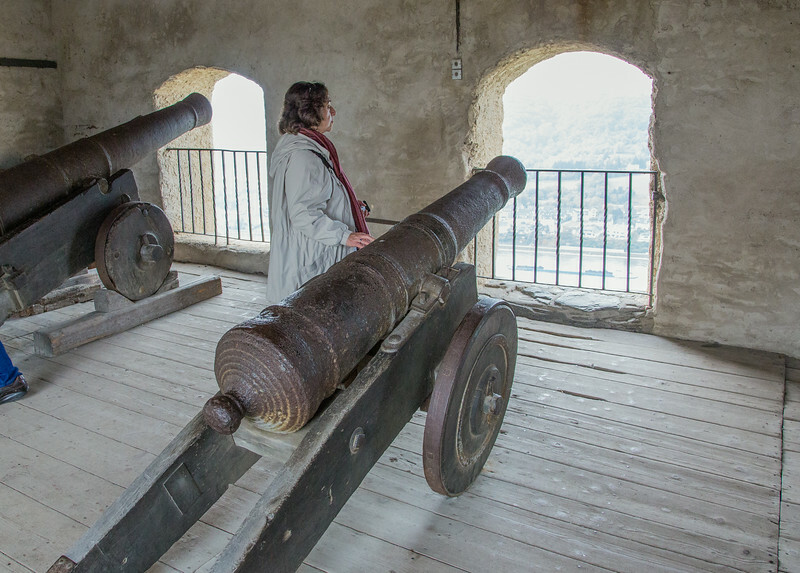 Dürnstein Castle, high above the Danube River, where Richard the Lionhearted was imprisoned during the Crusades. 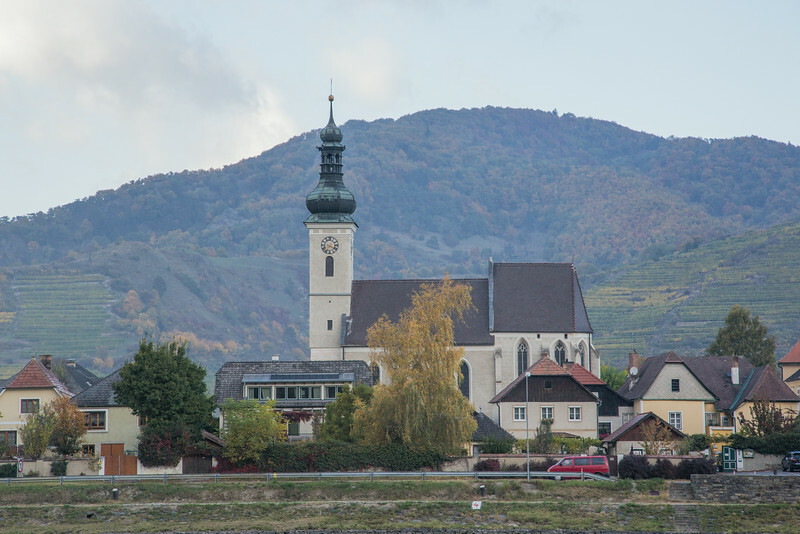 Pastoral scene in a small Wachau Valley (Austria) village, as seen from our riverboat while cruising down the Danube. 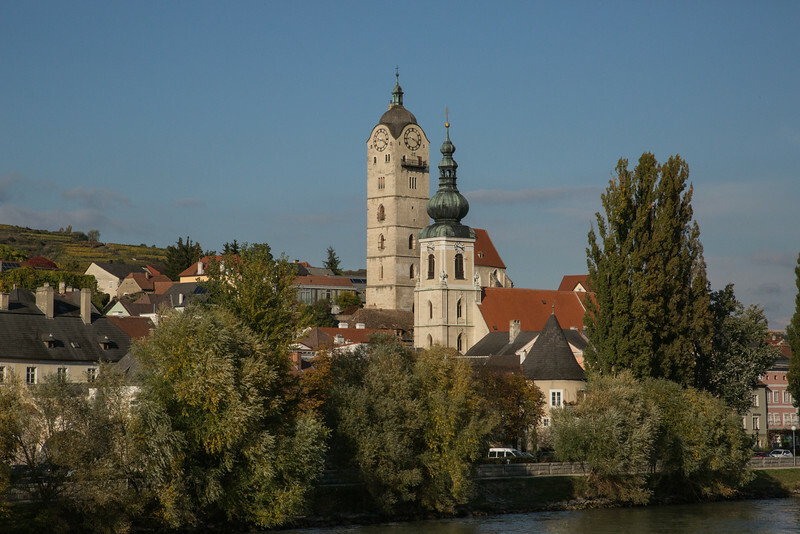 Krems is located at the confluence of the Krems and Danube Rivers at the eastern end of Austria's Wachau valley. 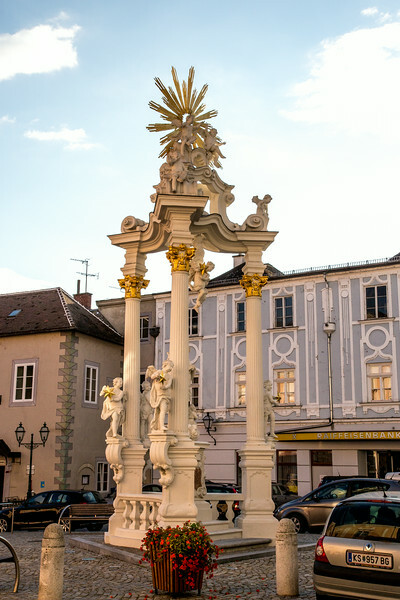 The Dreifaltigkeitssäule (Holy Trinity monument) in Krems, Austria, was created by Joseph Matthias Götz in 1738. 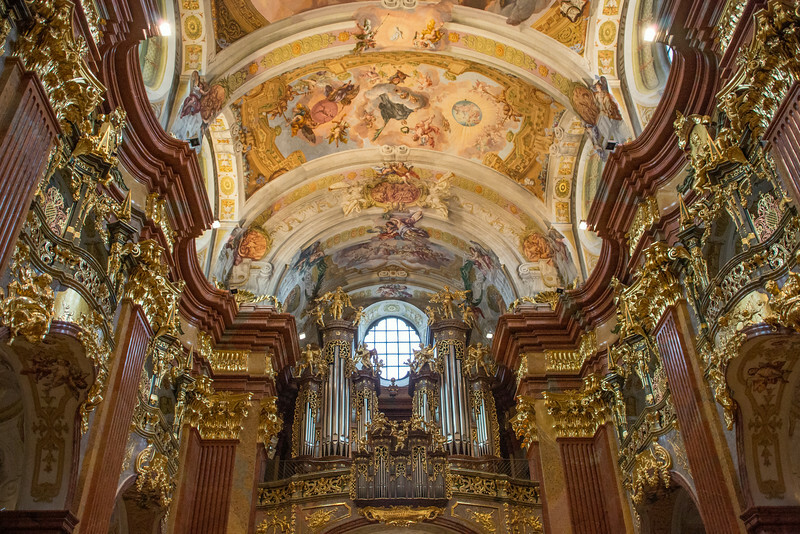 The three pedestals figures, St. Johann Nepomuk, St. Karl Borromäus and St. Veit, are crowned with the Holy Trinity. 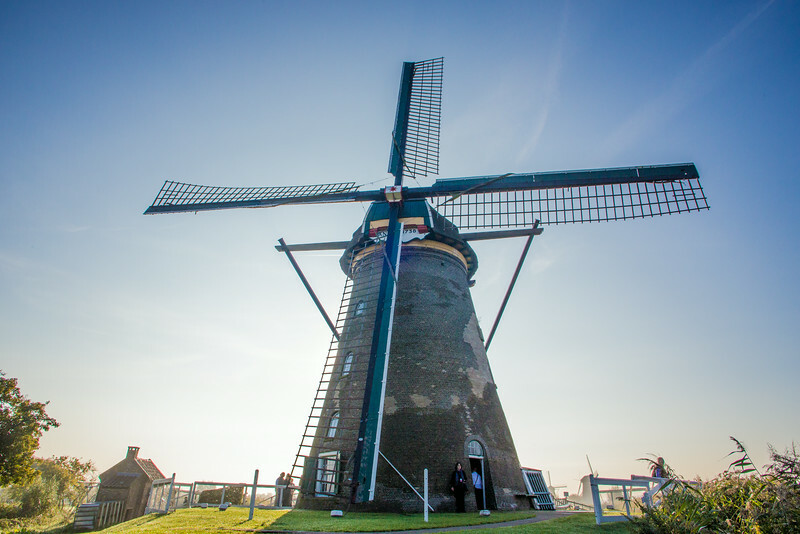 In the centre is a sculpture of the Virgin Mary. 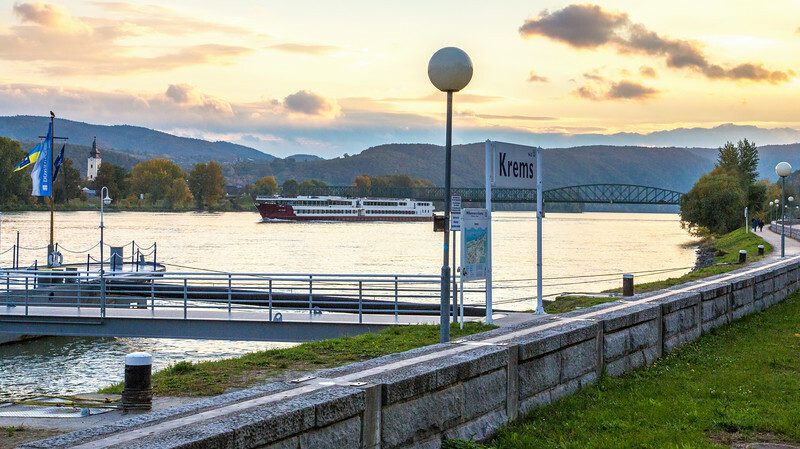 We spent time in Krems, Austria, with Herr Beyer, discussing coffee and the general European political situation. 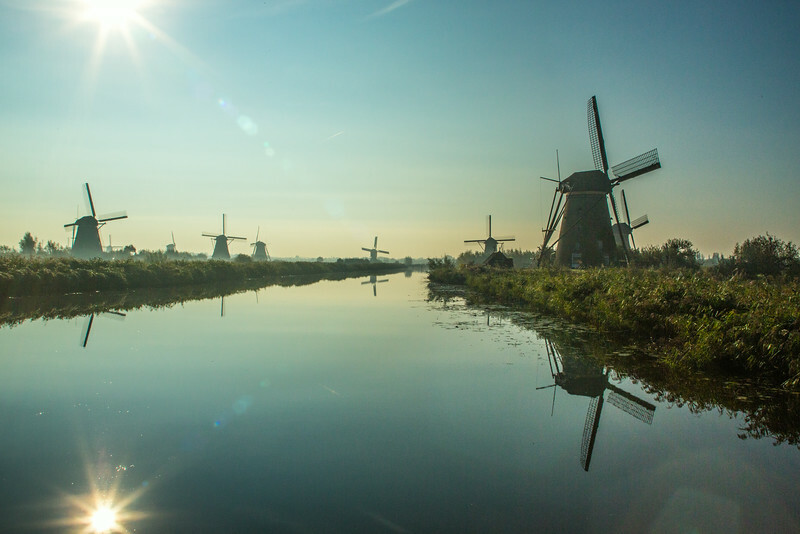 One of dozens of river boats passing by. 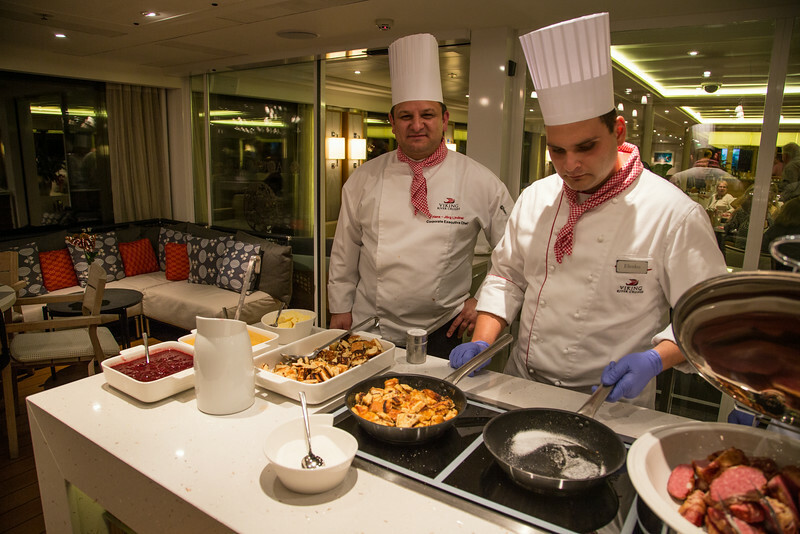 Our Viking River Cruises "longship" Bragi, docked in Krems, Austria. 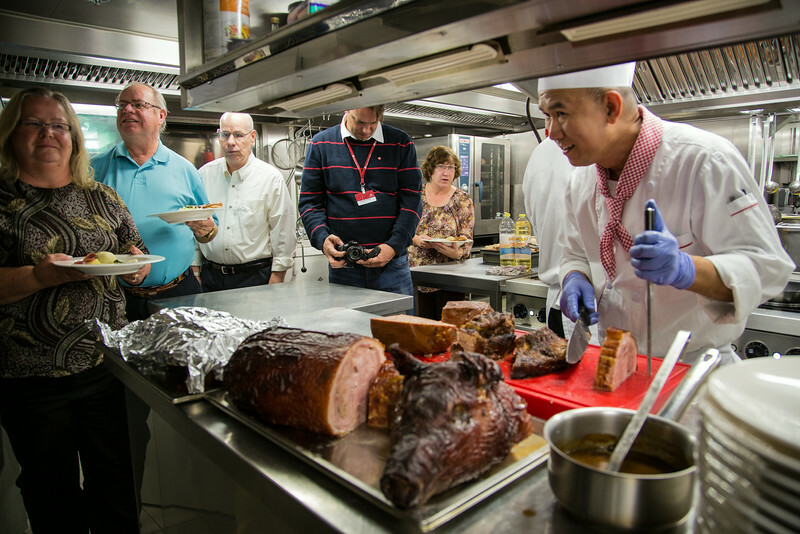 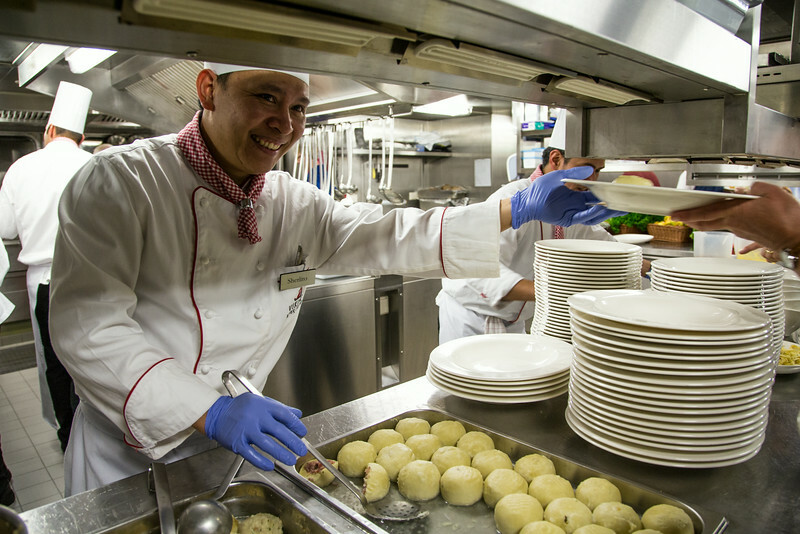 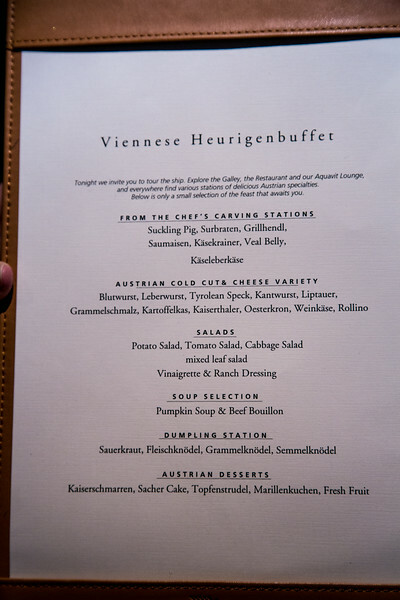 This was the special menu aboard our Viking River Cruise longboat Bragi on the night of the galley tour. 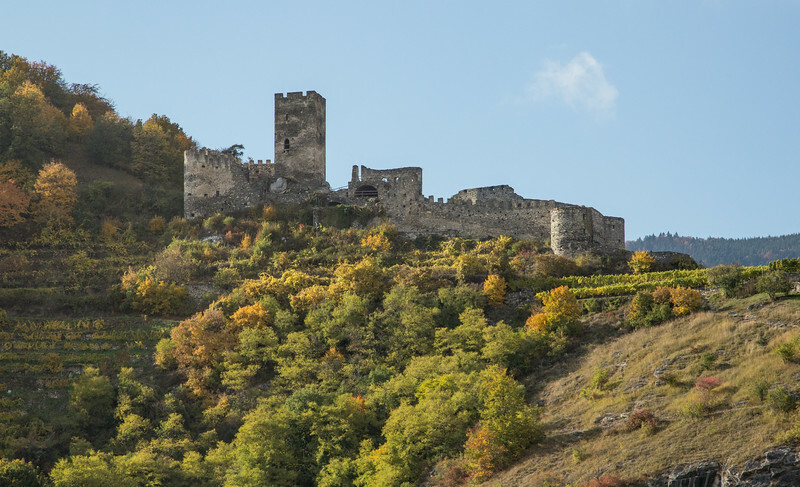 During its 700 year history, Marksburg Castle is the only hill castle on the Rhine that has never been destroyed. 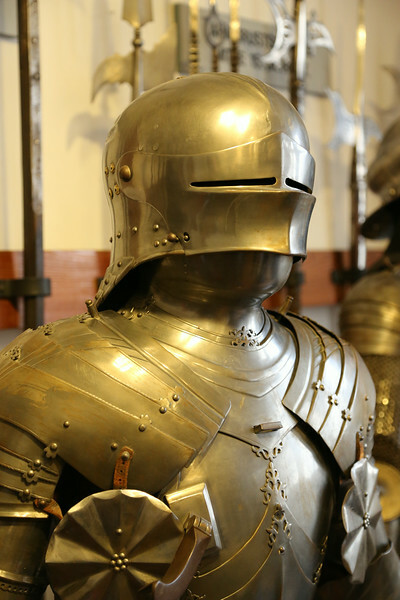 One of many authentic suits of armor displayed in the Marksburg Castle museum high above the Rhine River. 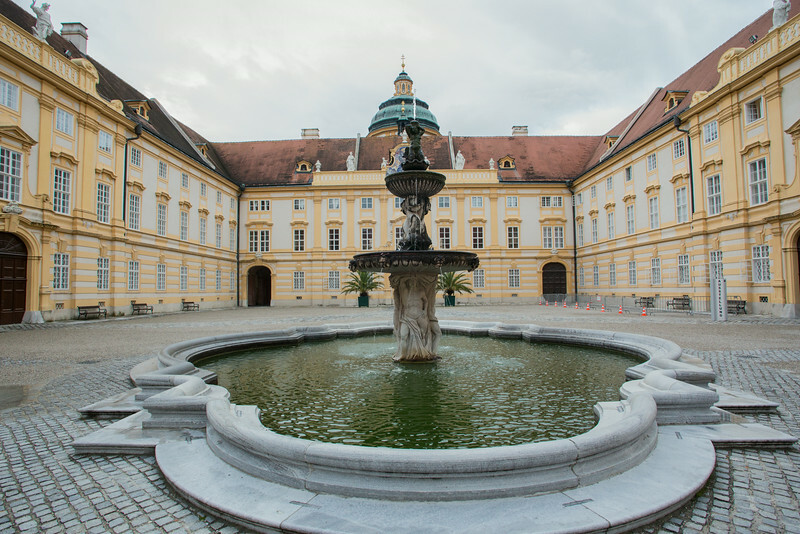 Fountain in the courtyard entrance to the Melk Abbey in Austria. 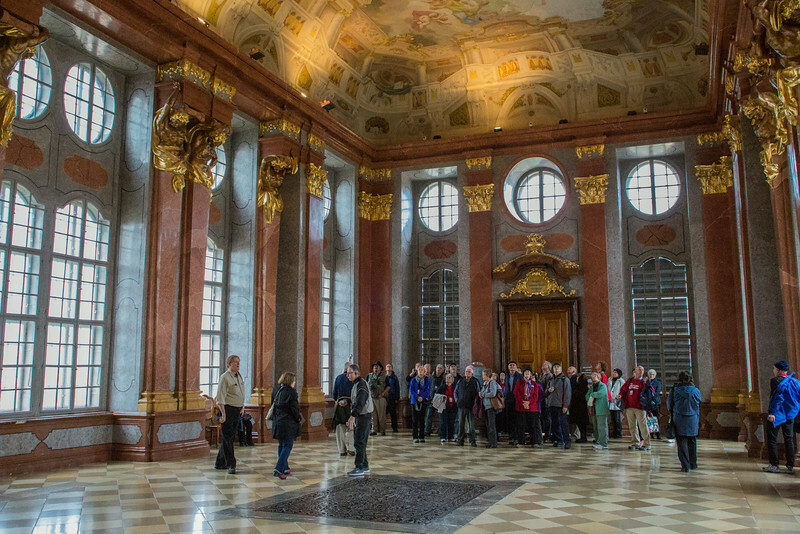 In the entry of the Melk Abbey. 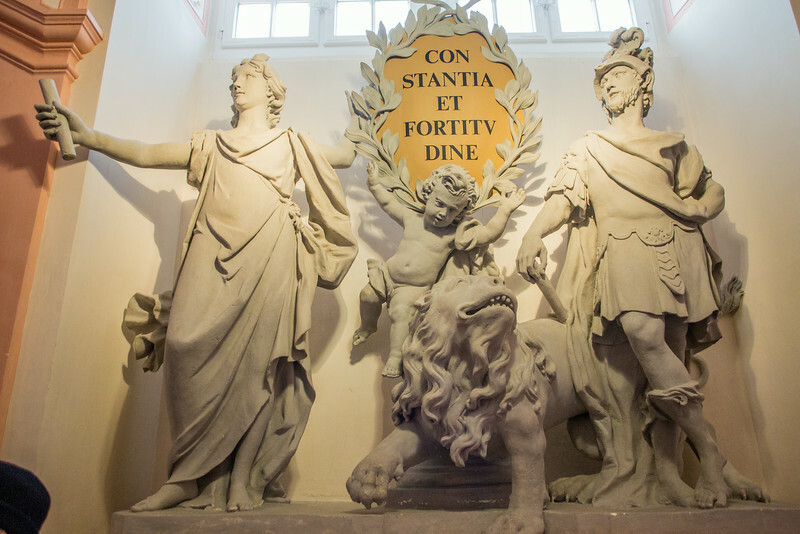 The Latin phrase "Constantia et Fortitudine" translates to "Through perseverance and bravery" and is attributed to German emperor Charles VI (1711-1740). 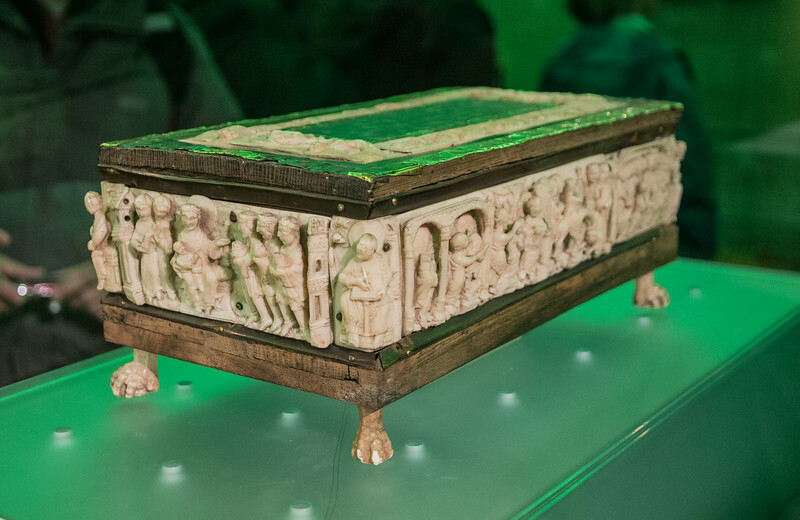 1,000 year old ivory box for transporting priceless relics. 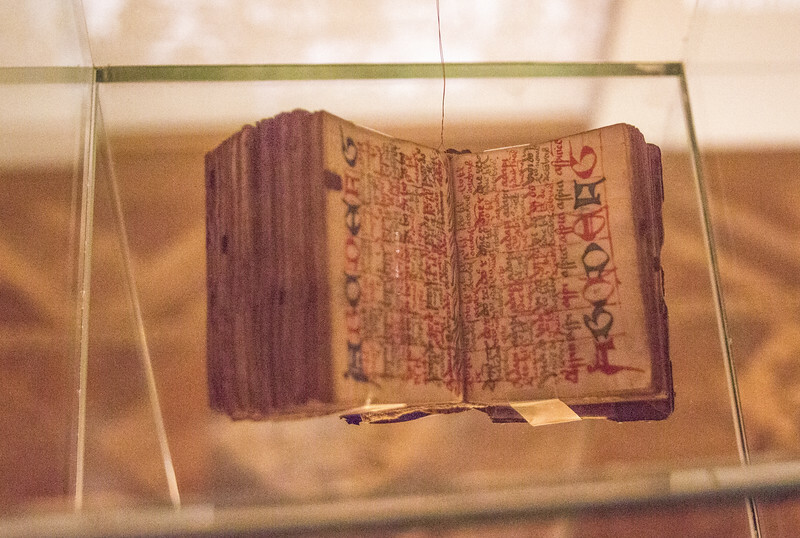 A treasure from the museum in the Melk Abbey. 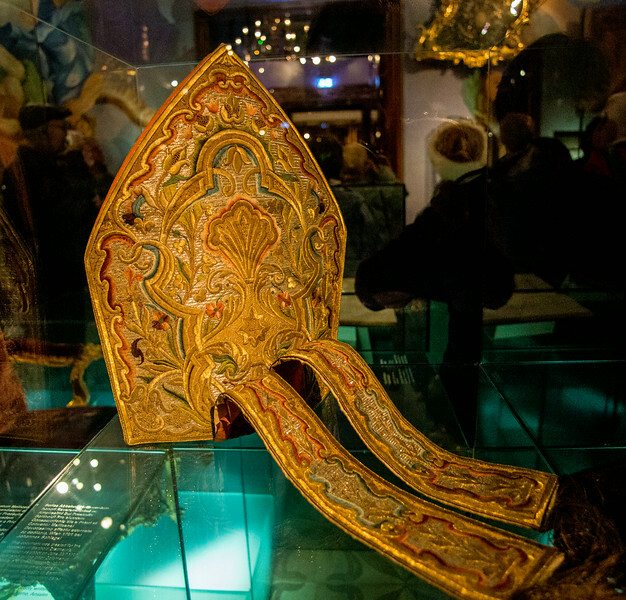 An ornate bishop's mitre displayed in the museum of the Melk Abbey. 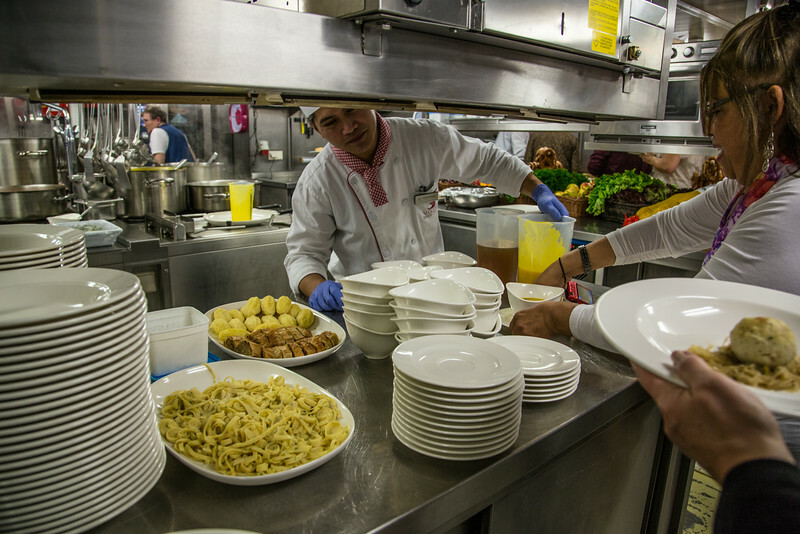 A massive room for the monks to gather on important occasions. 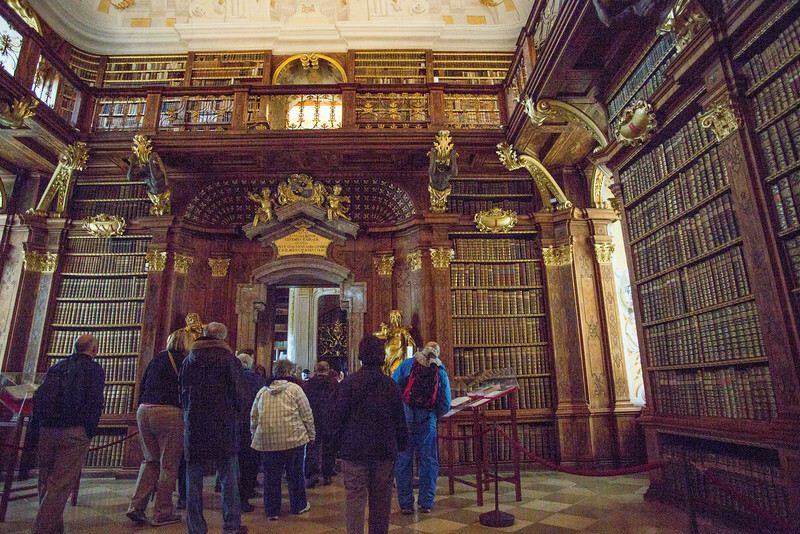 Photos were prohibited here for no clear reason, but I took my chances in one of the library's 12 very dark rooms. 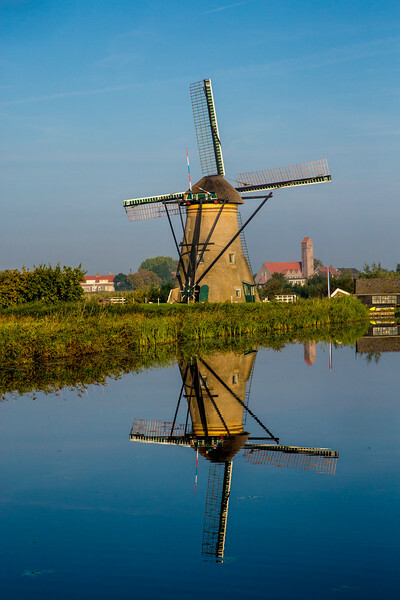 In all, they contain about 100,000 books including 750 incunabula (printed works before 1500), and thousands of volumes from the 16th and 17th centuries. 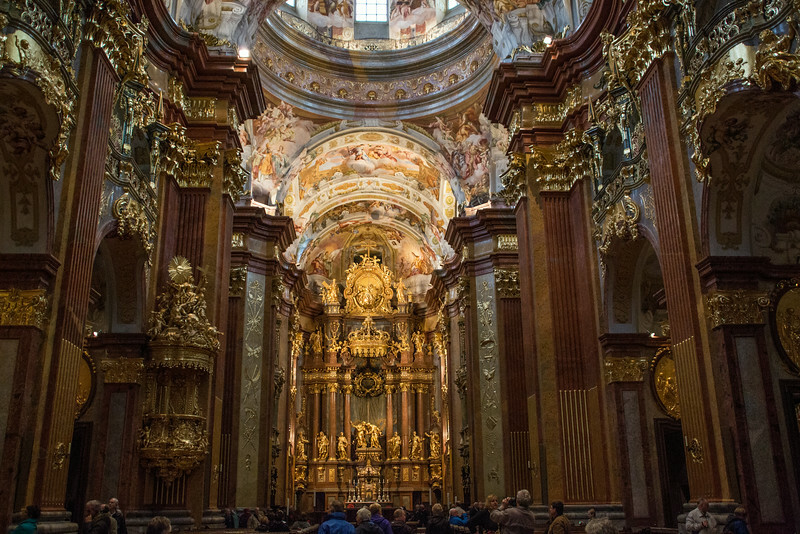 This ornate gold-filled chapel is still in operation, once the tourists clear out. 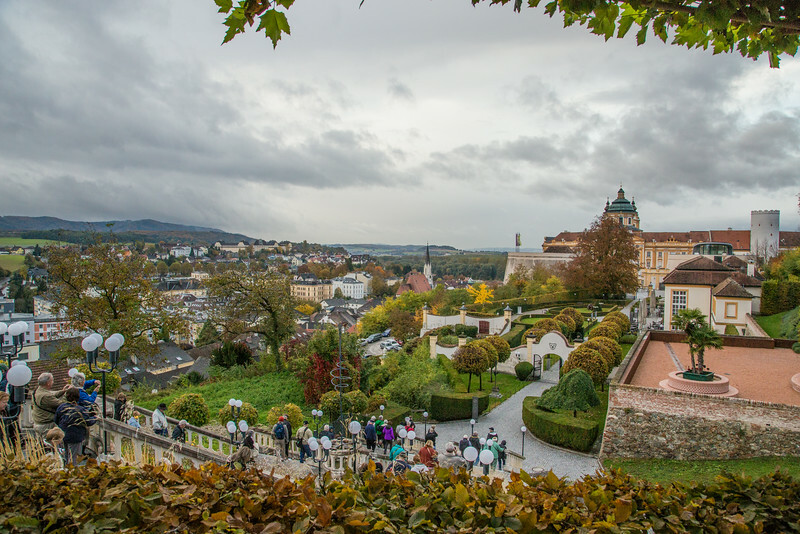 This is the rear of the Melk Abbey chapel, complete with pipe organ. 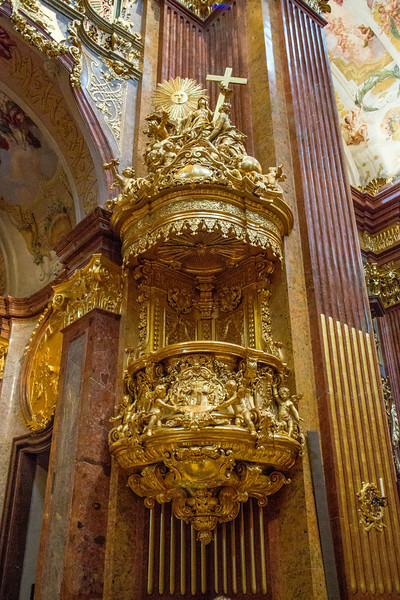 The pulpit in the Melk Abbey chapel appears to be solid gold. 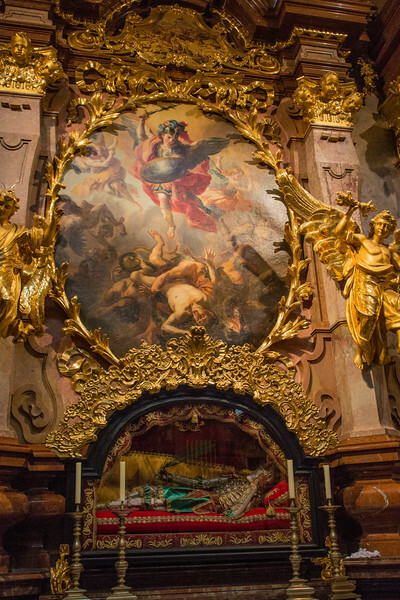 According to a sign in German and English, the body in the glass-fronted coffin is a so-called catacomb saint whose remains were given to the abbey by a Viennese cardinal in 1722. 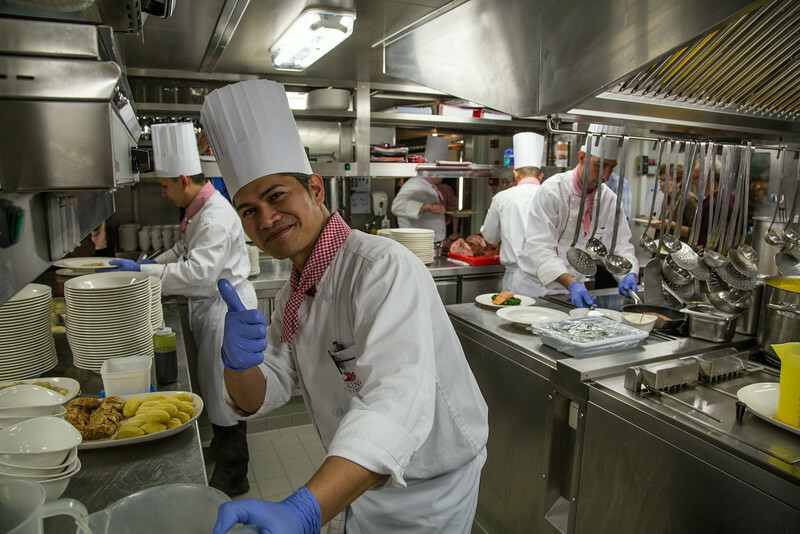 They didn't know his name, so he's now known as St. Clemmons. 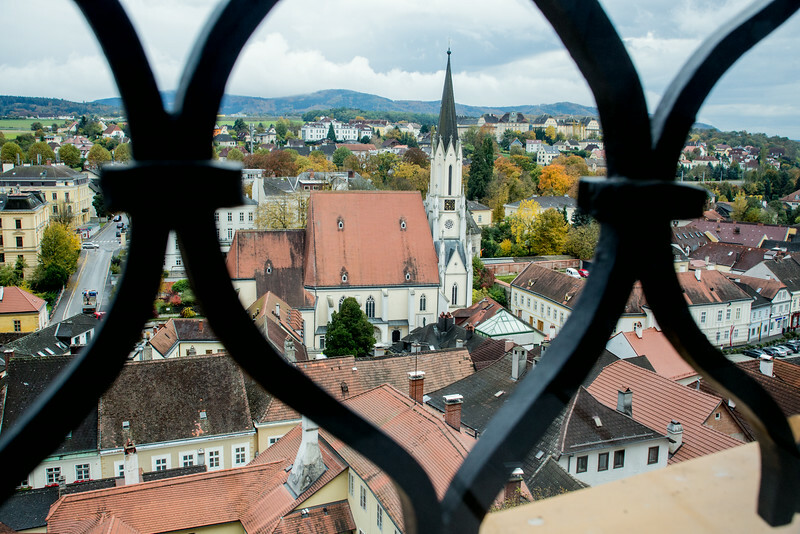 The town of Melk, as seen through the grated window of the Abbey's men's restroom. 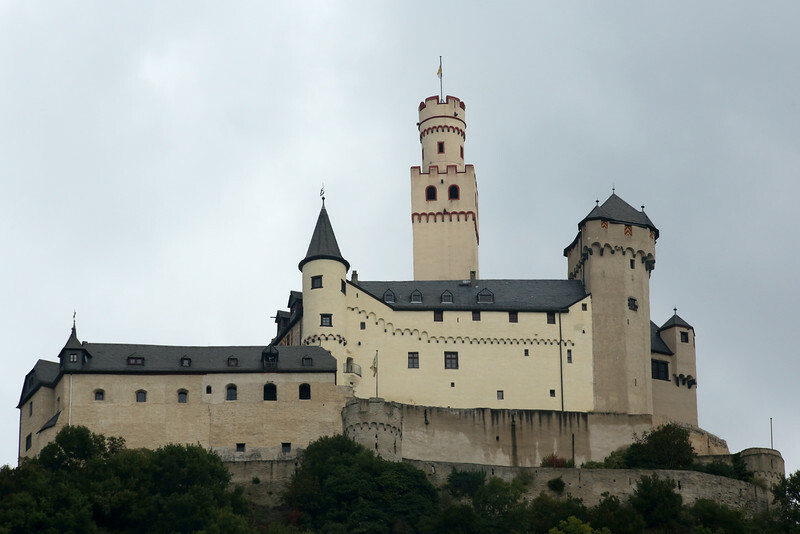 There's no ignoring its presence above the town of Melk, Austria. 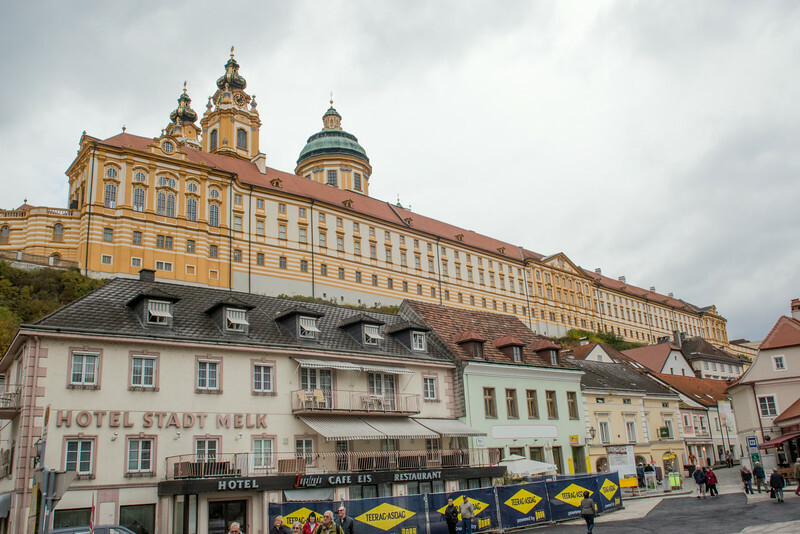 A traveling circus was setting up below the Melk Abbey, including this camel who was not too interested in me. 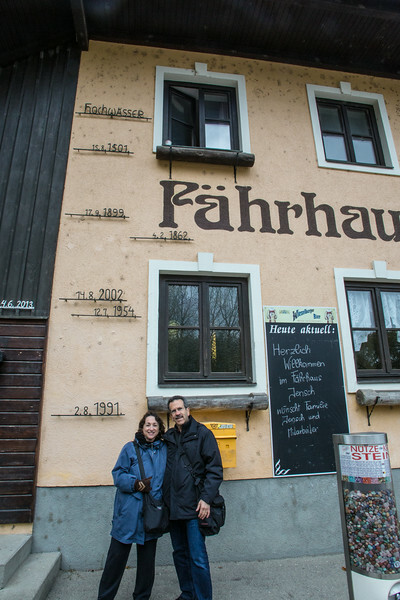 High water marks on the exterior of a Melk, Austria inn, dating back to 1501 AD. 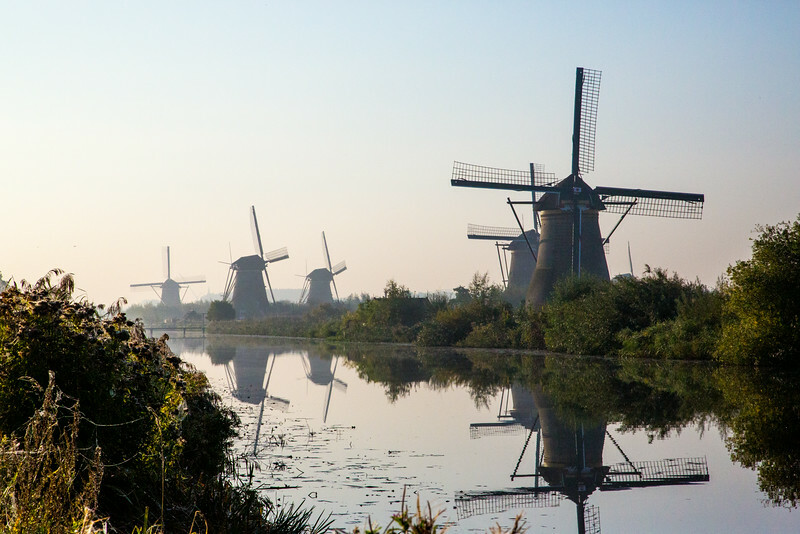 They had not gotten around to marking the 2013 flood, which was even higher. 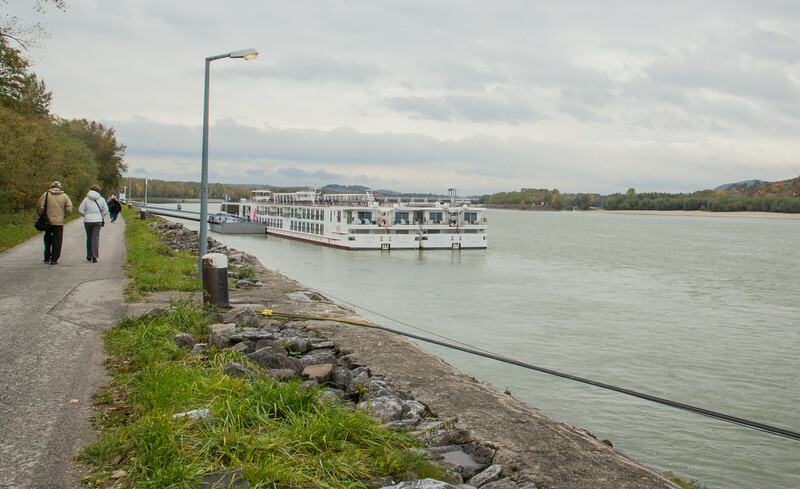 Whenever two or more river boats need to dock, but there aren't enough piers, they tie up together, and passengers walk through as if it was a long gangway. 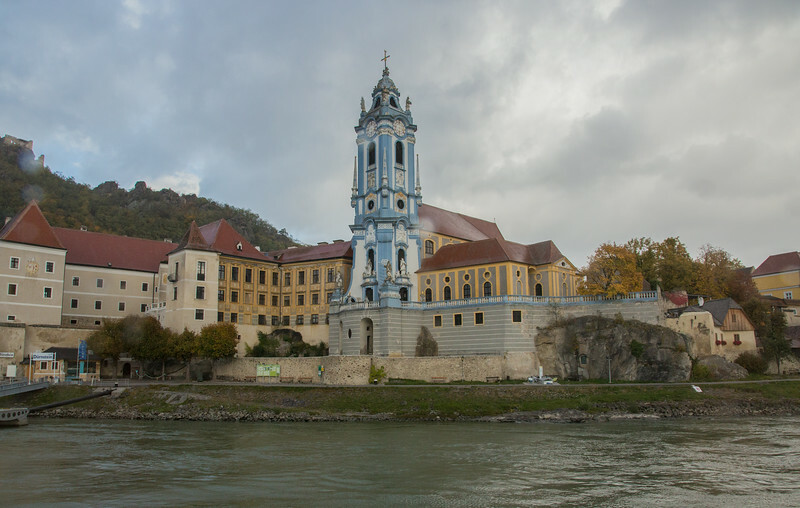 This is along the Danube in Melk, Austria. 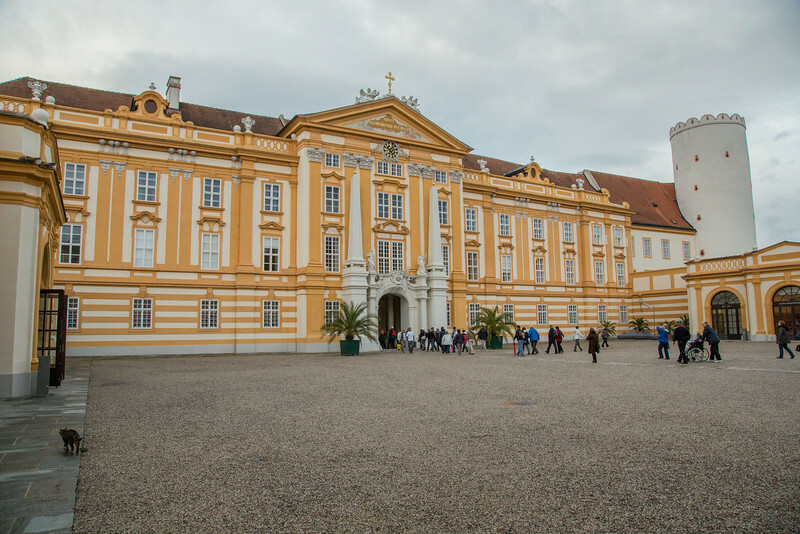 Entrance to the Abbey in Melk, Austria. 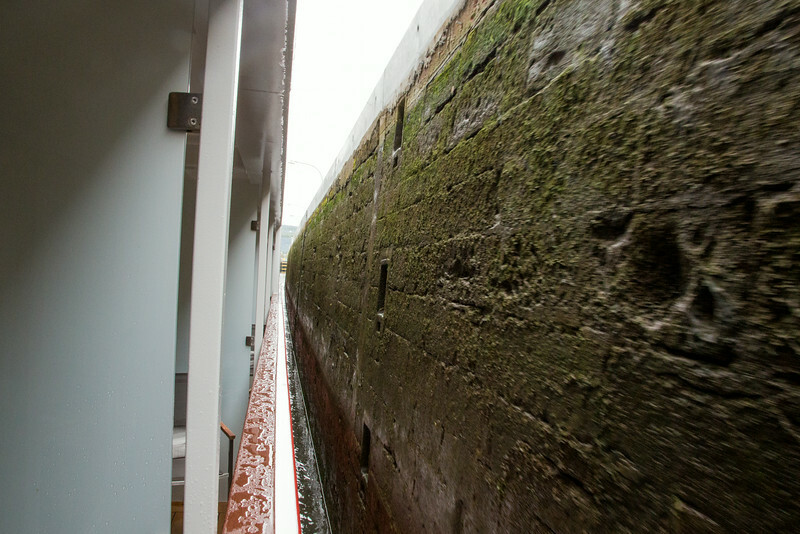 The river boat is a tight fit as we pass through a lock on the Main River on the way to Miltenberg. 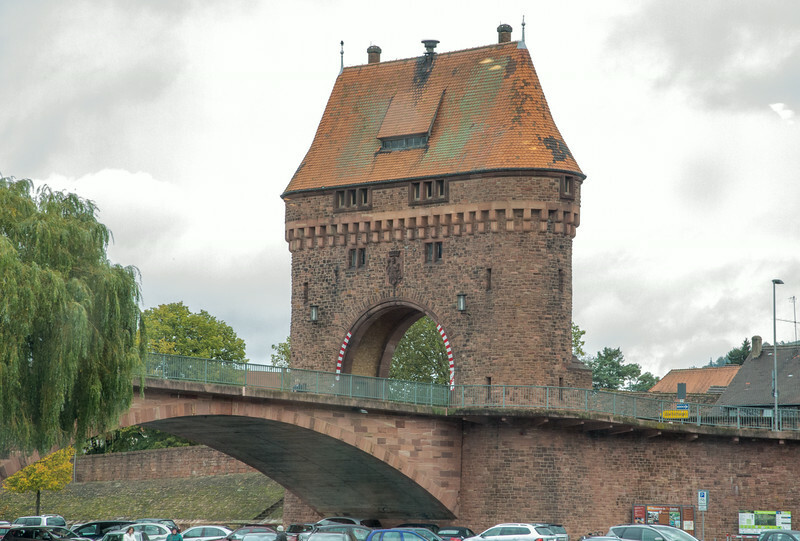 The Spessartbrücke bridge provides a dramatic entrance to the city of Miltenberg, along the banks of the Main River. 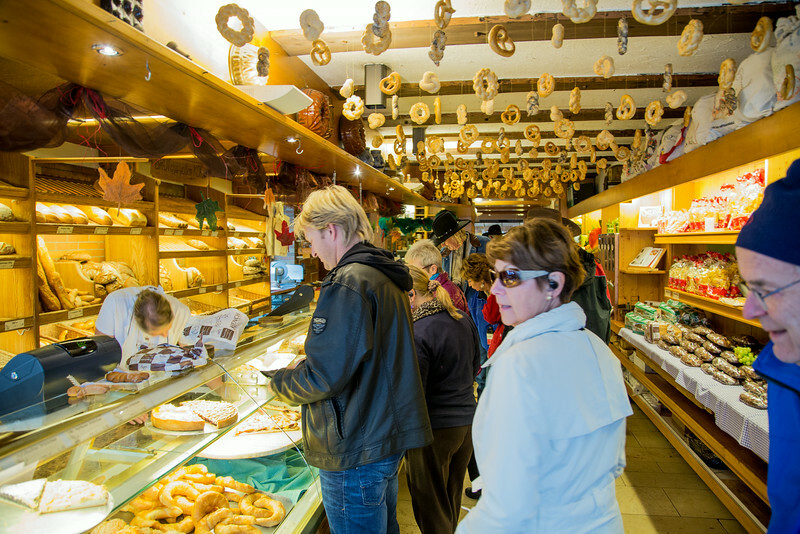 The pretzels are flying in this bakery in the town of Miltenberg. 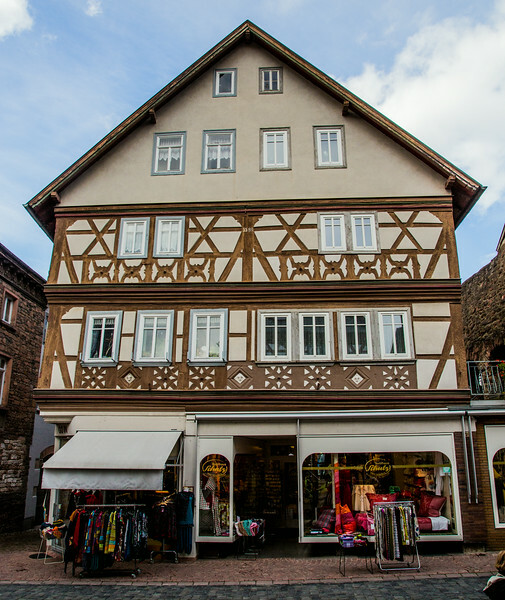 A typical restoration in Miltenberg; retail shop at ground level and residence above. 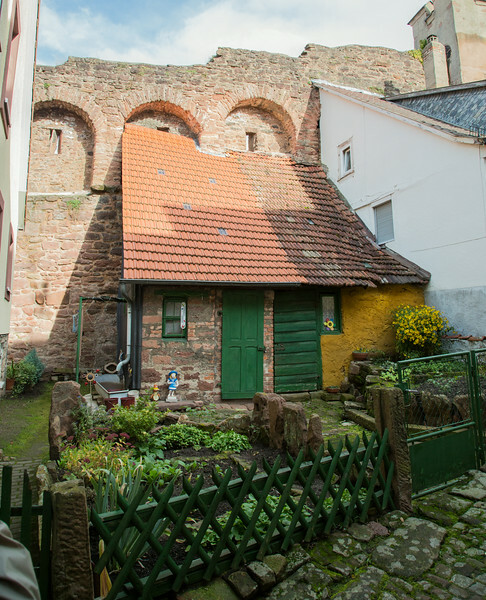 It may be small, but this little home is tidy and nestled against the town of Miltenberg's old city wall. 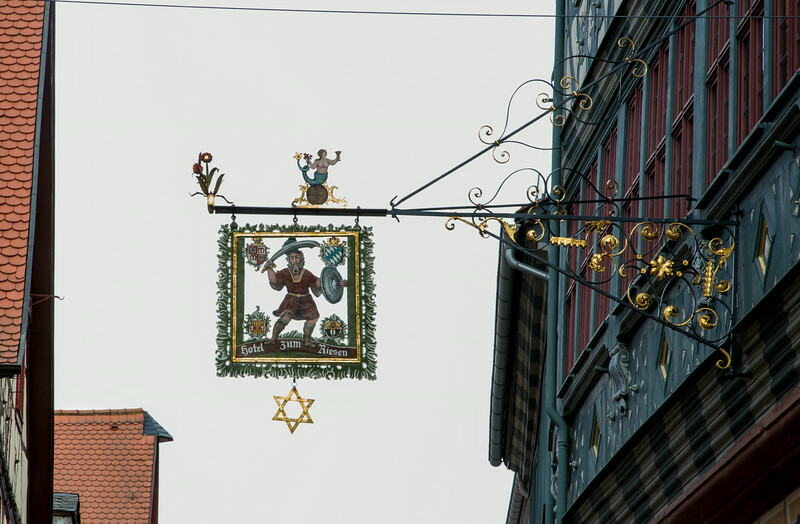 The star of David, hanging from this sign in Miltenberg Germany, does not signify anything Jewish. 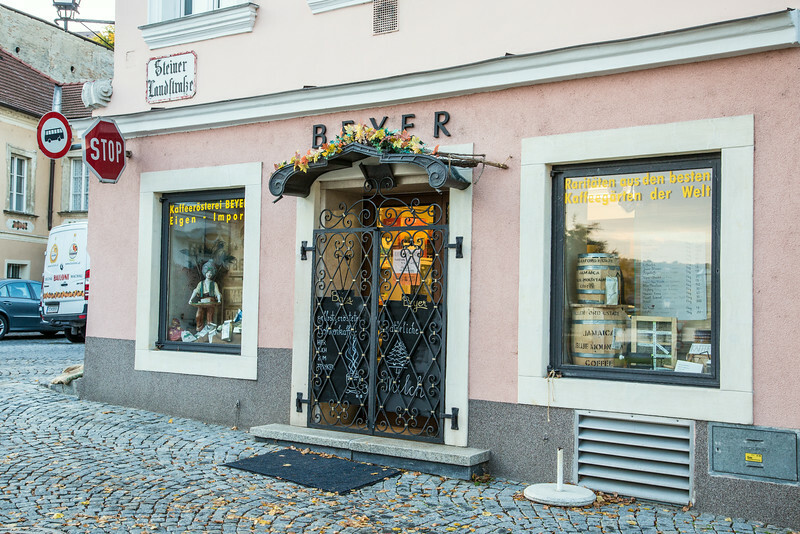 Rather, it is a Bierstern, an ancient symbol that denotes inns that were permitted to brew their own beer. 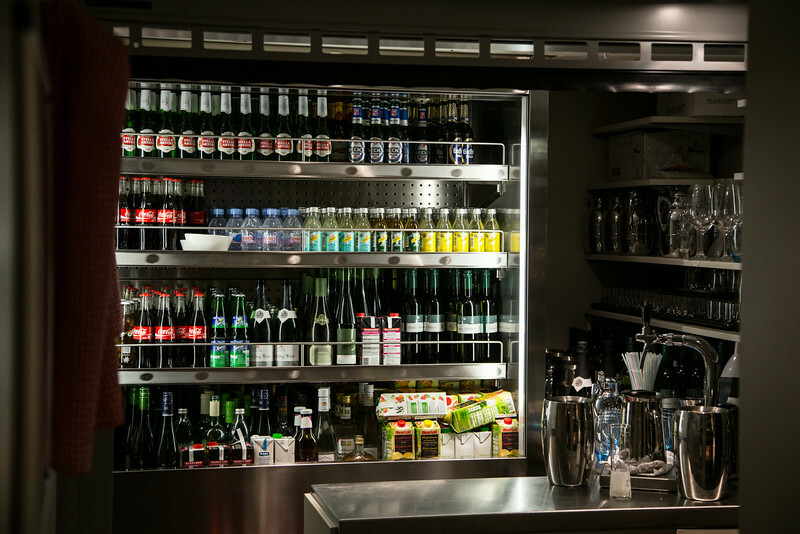 It was the official insignia of the Brewer's Guild as early as the 1500s, and represented that the beer served inside was free of any additives or preservatives. 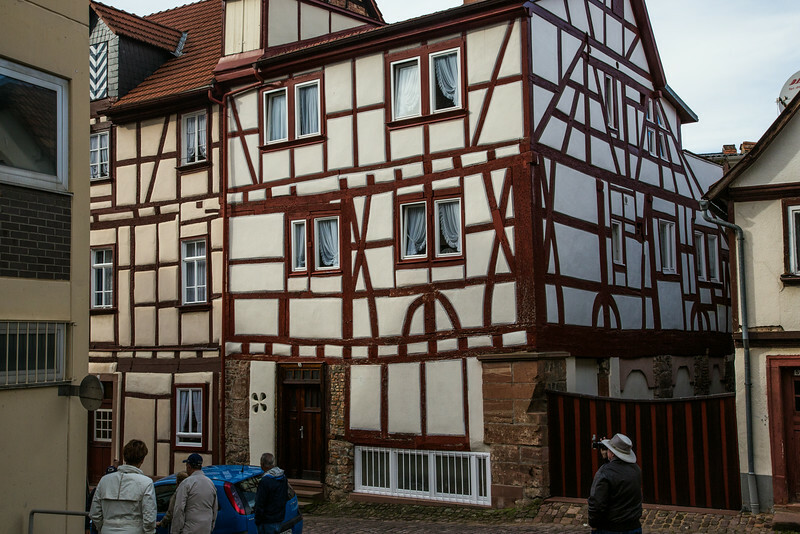 The inn is considered one of Germany’s oldest.